The very fact that Natalie Goldberg’s book ‘Writing Down the Bones‘ is easy to read is testament to her skill as a writer. This should be encouragement enough for any writer to follow her advice. Her ideas so clearly expressed that they are absorbed without effort. The variety of them keeps the momentum of the book going. Goldberg began teaching writing workshops in 1975 to nuns, hippies and juvenile delinquents amongst others. In 1974 she began practising sitting meditation. She studied Zen formally from 1978 to 1984 and this deeply influenced her approach to writing. This fact, however, will probably mean that writers will either love or hate the methods exposed in ‘Writing Down the Bones’. Writing is considered a discipline similar to running, for example: it must be practised every day. Goldberg sees writing as being about ‘trusting your own mind and creating a confidence in your experience’. She also believes that writing is a practice that involves discovering and understanding one’s whole life, and ultimately finding sanity. The chapters are so short that it is easy to use this as a book to dip into from time to time. One section might tell you to be very precise, whereas another might tell you to ‘lose control’. Goldberg emphasises that ‘Every moment is different’. Sometimes you need a private place at home to write; at other times you need to go out, go and sit and write in a coffee shop, for example. A change of environment can often provide the inspiration needed to cure writers’ block. Initially published in 1986, Goldberg’s book deals essentially with the process of writing by hand in notebooks. She can imagine using a Mac, but computers were of course a rarity in the mid eighties. Her attitudes to the physical process of writing may seem alien to today’s writers who have switched to using keyboards and see their words before them on a computer screen. There are still, however, aspects of Goldberg’s approach that can be applied to any form of writing. Timed exercises, writing together with a partner or group and then reading work aloud to each other would be stimulating in whatever form. 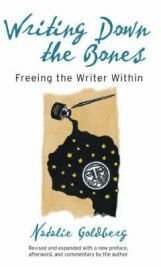 ‘Writing Down the Bones‘ is more likely to appeal to those interested in creative writing, although Goldberg does state that her methods can be applied to dissertations, business letters, and so on. The subtitle ‘Freeing the Writer Within’ suggests that the book concerns creativity rather than writing according to a strict set of rules. Although Goldberg sees editing as the imposition of the ego on a piece of writing, she does give advice on revision towards the end of the book. This is a book that could provide inspiration and guidance to writers of novels, short stories and poetry who find it difficult to make that initial transference of ideas to paper (or word document). It could also be valuable as a resource for teachers of creative writing to discover new ideas for writing workshops. Whilst ‘Writing Down the Bones‘ is unlikely to appeal to those who have no affinity with a Zen approach, others looking to break through their inhibitions will find many words of wisdom within its pages. No Comments on "Writing Down the Bones"